PeriPera Love Fairy & Heart Glow F/W Collection 2013 | Memorable Days : Beauty Blog - Korean Beauty, European, American Product Reviews. I wanted to blog about this brand for a while. I'm talking about the Korean brand PeriPera. Peripera is the second brand created by CLIO Professional. Back in September 2013 they released their Fall/Winter 2013 collection. Jup, i'm sorry that i'm a bit late for sharing this collection. I was hesitating to blog about this, but I decided to do it after all because it's a cute brand and I have the feeling that not many of you are familiar with PeriPera. Today I will be sharing the products of their Fall/Winter 2013 collections called Love Fairy & Heart Glow. Be aware that this blogpost is picture heavy, please wait until all pictures are fully loaded. You can purchase these 2 collections - Love Fairy & Heart Glow collection from PeriPera at the following shops: w2beauty.com, in2face.com, koreadepart.com, ebay seller IamLove-shop and at koreabuys.com. The prices of the products varies from $5 USD to $15 USD, it depends on the product and where you buy it, but PeriPera in general is definitely an affordable brand. These glow sticks are available in 5 colors. My favourite out of the 5 is Magic of Love! Peripera has two lip butters in this collection: the Hello Day Lip Butter with SPF15 (for daytime) and the Sleeping Lip Butter (for night time). Each tin contains 10g of product. Gotta keep your lips moist 24/7 right ^^? There are 3 different kinds of Love Fairy Lip essences: two color changing lip essences - lemon & cherry and 1 is colorless. 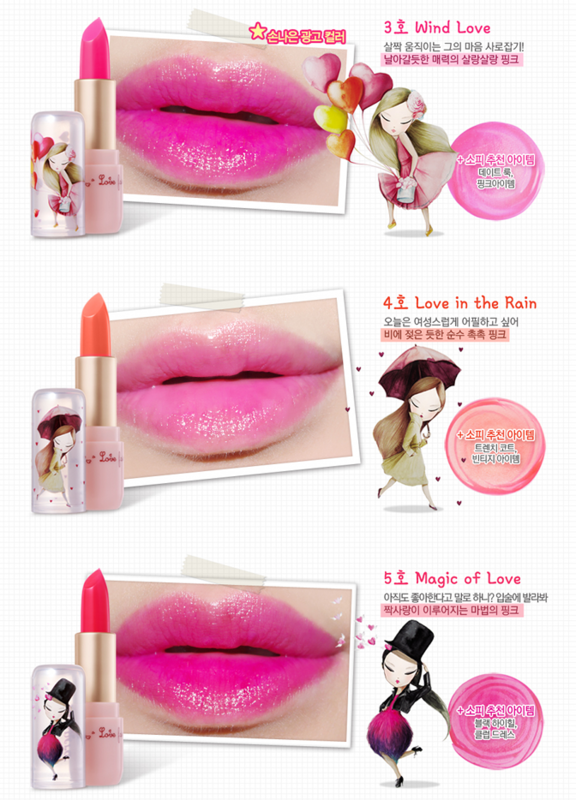 The lemon lip tint looks yellow, but it will change into a sweet pink glossy color. 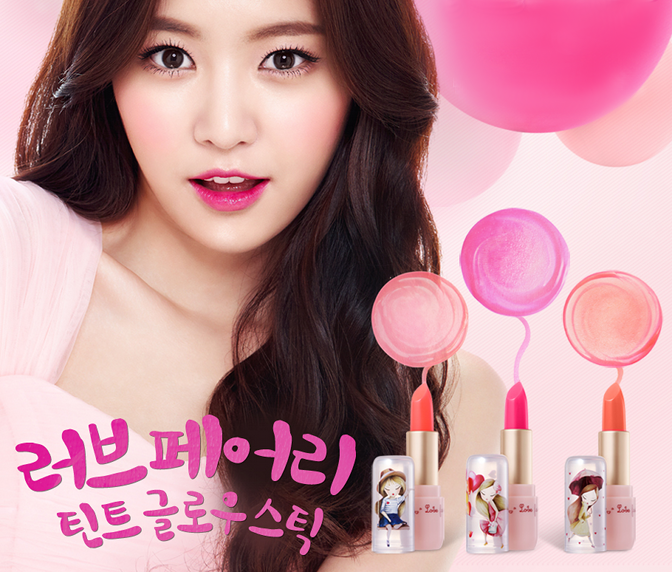 The Cherry tint essence looks light pink but the color will change into a vibrant pink. In this collection there are two types of hand creams: no.1 is called Mild Love and no. 2 is called Deep in Love. Mild love has a cherry blossom scent while Deep in love has a baby powder scent. Hence the name, the first hand cream is mild & light and the second hand cream will deeply nourish your hands. Which one would you try? This is the CC cream from the heart glow collection. It comes in one shade but in the pictures it's shown that the CC cream is suitable for people with a light as well as dark skin tone. This is a powder with SPF30 PA+++. It comes in two shades: #21 and #23. The packaging is different per shade. This powder will give you a smooth and silky finish which will make your pores less visible. In the pictures below you can see some pictures that a blogger took while testing this product out. This highlighter comes in two shades. The first shade is white/light pink-ish which is suitable for people with fair skin and a cool tone and the second shade is a dark bronze highlighter color that would suit people with a warm tone. In the cute pictures below you can see how you should apply the highlighter. Make sure to check which head shape you have first. My head is similar to the third one, so i should apply it on the T-zone area and at the sides of my eyes. It looks so easy to apply because it's a stick! HAVE YOU HEARD OF PERIPERA BEFORE? source: all pictures are from peripera.co.kr and edited by me. this blogpost contains affiliate links.